Sometimes simple and practical applications provide better results than other more complex tools. That is the case with Burning Mill, a free software development that has an interface that is practically identical to that of Windows Explorer. It is an application that has been designed to burn CDs and DVDs in a very simple way, only requiring the user to drag and drop files between two windows, selecting the kind of disc, the speed at which it will be burnt and wait for the program to finish the burning process. The program includes a utility to be able to rip music albums and convert the audio files to OGG, WAV or WMA. What's more, it includes a function with which we will be able to burn disc images in CUE/BIN or ISO format. 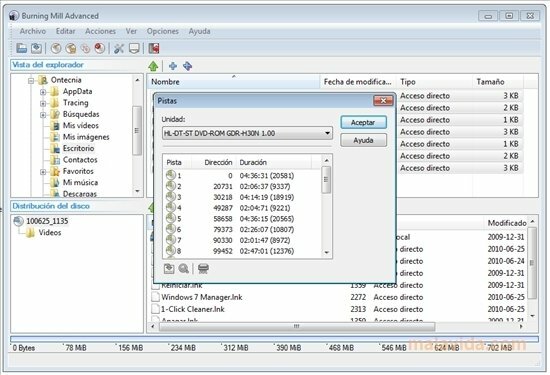 Another great feature of this simple tool is the one that allows us to create multisession CDs and DVDs, in such a way that we can use the discs until we fill them. If you were looking for a simple and free burning tool, you should try Burning Mill.